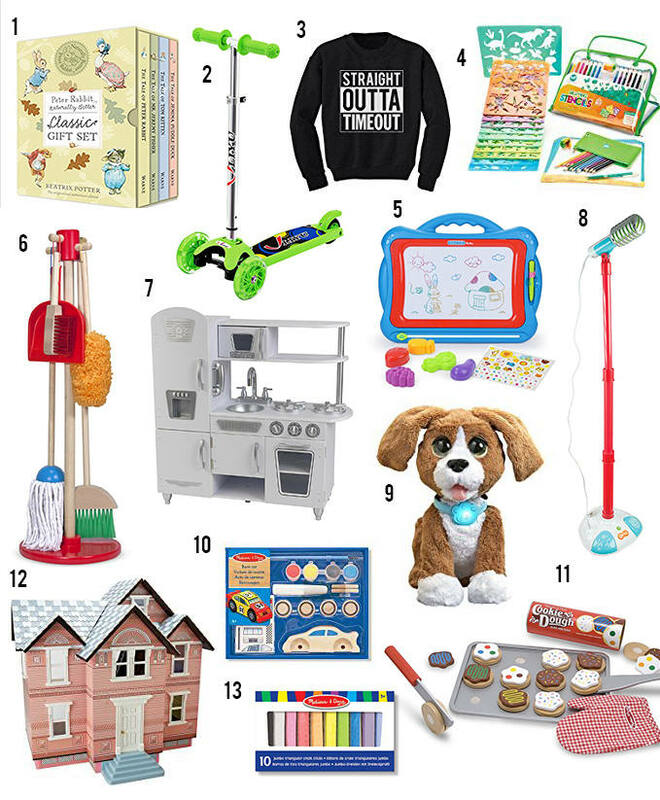 I think this gift guide may have been the most fun to put together! I love finding fun and unique gifts for toddlers. These presents will definitely keep the little one in your life entertained. Just to be clear, number 3 is hilarious and maybe not a gift but I had to include it because it’s funny, right mamas? We all have at least on little one that can wear this lol! All of these items have great reviews, and I trust that your toddlers will thoroughly enjoy them. There is one that doesn’t have a great review BUT we own it and actually love it – it’s Zoe’s favourite toy and it hasn’t left her side in the year she’s had it. Let me know what you think and if you already have any of these! You can find all of these items on Amazon.ca and the best part is? Most of them are on Amazon Prime so you get free next day shipping – the most convenient way to shop over the holidays! The Vintage Kitchen – Isn’t it adorable? Toddlers love to mimic mom and dad and this is the perfect gift for your little mini me. It lets them get creative in the kitchen and use their imagination to come up with their own tasty recipes. Magnetic Drawing Board – We had one of these growing up and now I know why…All of the drawing fun without the mess haha. When your little one enjoys drawing on the walls this is the perfect replacement for crayons. FurReal friends – This is Zoe’s favourite. They are battery operated pets that you can walk and feed, they even poop. She gives it a two thumbs up! Decorate Your Own Wooden race car kit – It doesn’t get more special than this. A great combination of crafts and toys, your little one can paint and decorate their own car. I guarantee they will be so proud of their creation and will play with this much longer because they made it themselves! This post was sponsored by Amazon however all thoughts and opinions are my own.